One of the pervasive themes at Allegheny College is their focus on “unusual combinations.” They are interested in students with diverse interests. At the end of their sophomore year, students must select both a major and a minor, and they must come from different disciplinary areas. Writing is important at Allegheny. Speaking and presenting clearly and effectively are part of the norm for most classes here, and seniors are required to do a capstone research project in their major, which they must present and defend before faculty members. [I had lunch with a political science professor; he sent me a link to a description of some of these senior capstone projects (called “The Comp”) and you can see them here.] The kind of students who succeed here are those who are eager to be “immersed in the pursuit of academic inquiry,” according to faculty members. With just 2,100 students (and no intention to grow), Allegheny students have direct and regular contact with their professors. The largest lecture courses are introductory science classes, which could have up to 60 students, but labs would be smaller and attended by the professor, and most classes are closer to 20. Allegheny is leading the way in environmental sustainability, with all of the college’s electricity wind-generated. Their recycling is extensive, and much of the food served in the cafeteria is grown on campus. 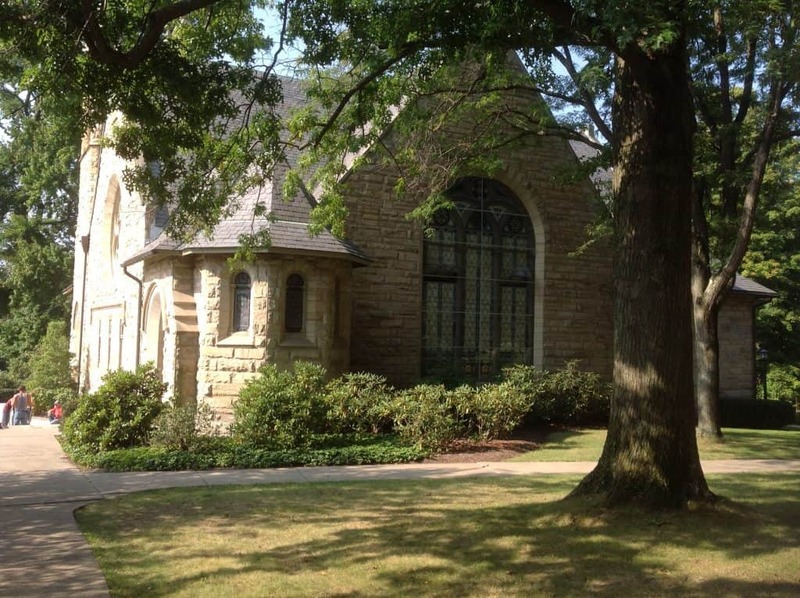 Allegheny is consistently recognized by the Sierra Club and Princeton Review as a “green college.” They were also listed by Reform Judaism Magazine as one of the “Small and Mighty” colleges with an active Hillel. Students at Allegheny talk about the sense of belonging here – they are part of a community. Given that each student must have both a major and a minor, they relate to each other on different levels academically and socially. One student I spoke with said that she was able to see beyond the categories into which her high school classmates had previously fallen: athlete, science brainiac, theatre geek, because her colleagues at Allegheny are so multi-faceted. Allegheny College is a member of the Colleges That Change Lives, and administrators, faculty and students make a very convincing argument for the power of the liberal arts education. The college offers an intense, rigorous academic atmosphere whose students take advantage of experiential learning and close relationships with professors. Allegheny is about two hours north of Pittsburgh. The short video I took of my tour guide Lizzie, a theatre major and chemistry minor, is below, and you can see all of my photos from Allegheny College here. Our son was accepted to Allegheny for this Fall and when he visited he was really impressed by the energy and engagement of the students. It ended up being one of his top choices. The way the faculty and administration reached out personally impressed us all. They also offered strong financial aid/scholarship money. The other notable thing was, while they are not an urban campus, they have a very strong alum network and have worked to develop their presence in Washington D.C. with their Poli Sci programs, which seemed quite good. Allegheny is definitely a rising campus worth investigating if you are an interdisciplinary, inquiring mind, looking for challenge and a fresh start and want to live and study on a small campus, that is in a somewhat remote feeling, rural setting, but not disconnected from the world. While he decided to attend another school, he really did take a serious look at Allegheny, which he wasn’t necessarily expecting when we started all this, and it was high on the pile at the end, competing with strong, well regarded schools with similar qualities. I could not stop thinking about you guys when I was on this campus yesterday! I think he would have fit in beautifully there. I can’t wait to recommend Allegheny to other interesting and multi-faceted students.